With an attractive new slipcase and binding, this compact Bible is an ideal gift and spiritual companion. 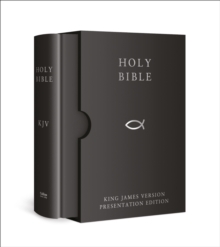 The full text of the ever-popular Authorized King James Version Bible, with all its literary beauty and poetic grandeur, in an attractive size and with beautiful binding and slipcase making it an ideal gift. Includes silver gilt edged pages and white marker ribbon.